"On October 16, 2013, 437 students, 52 teachers, and 24 additional staff from Bay Point Preparatory High School in suburban Milwaukee, WI vanished without a trace. Countless light years away, far outside the bounds of the charted universe, 513 people find themselves in the middle of an ancient, primordial wilderness. Where are they? Why are they there? The answers will prove stranger than anyone could possibly imagine. 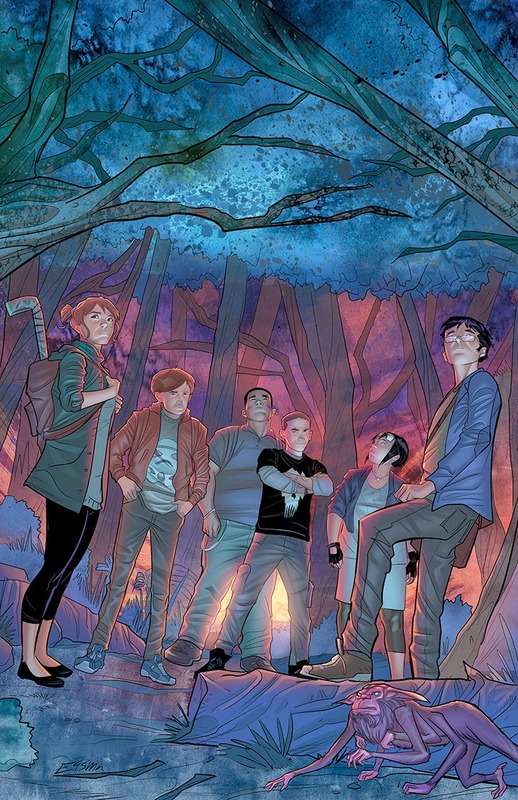 Collects issues 1 to 4 of the critically acclaimed series." 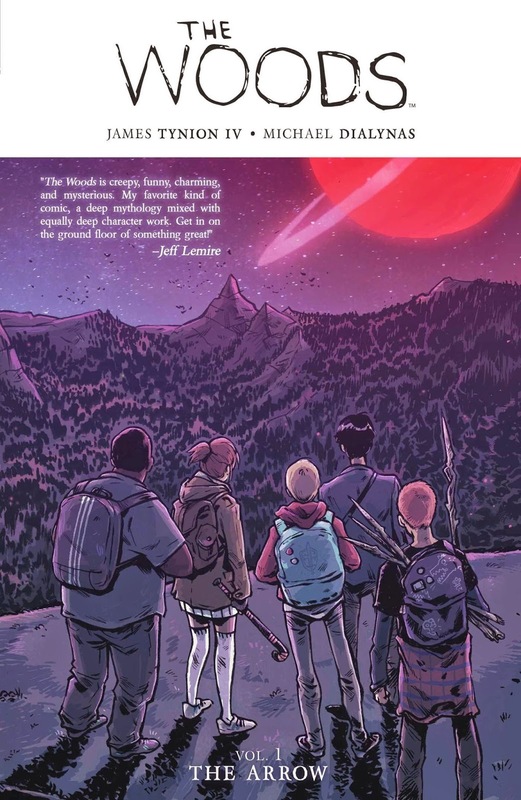 The Woods is everything I want from a weird horror comic. It's surreal and there is a big mystery right from the start. 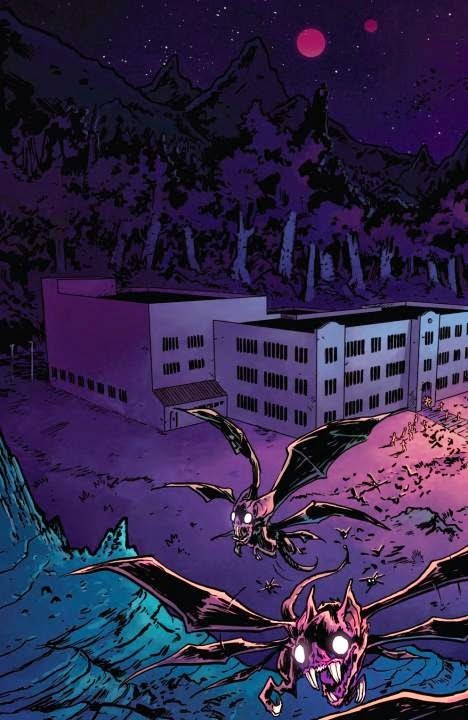 The high school is transported to some crazy alien world for no apparent reason. The only clue is a stone arrow that is communicating with just one student- Adrian Roth. He and a band of misfits decide to venture out into the monster-infested wilderness to follow the path laid out by the mysterious entity that they believe summoned them to this distant world. Meanwhile, back in the school, the teachers are struggling to come up with a plan to ensure the children's survival, and the student council is at odds with them on the best way to handle the situation. It seems that factions are forming and the staff and students may tear themselves apart before the monsters even have a chance. The artwork is spectacular and the palette is what I love the most. In the normal world they give us familiar scenes- a high school with beige walls and grey lockers- the boredom of a concrete place of learning. 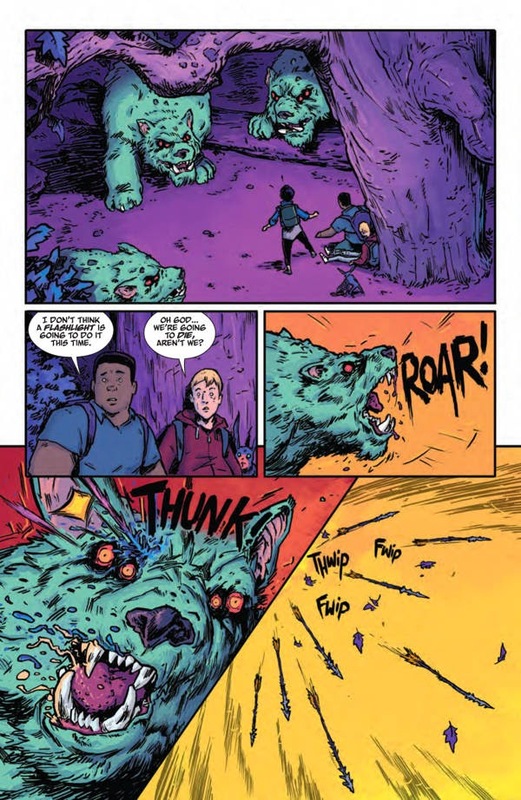 And immediately upon entry into the alien world that theme shifts and we find ourselves thrust into a landscape of purple skies, black, ominous trees and neon green wolf-beasts that leap out from the darkness. The colors amplify the sense that this is truly a world unrecognizable to us. So, this gets a big thumbs-up from me. It's scary, it's weird, and it appeals to the senses. I give it 5 stars.